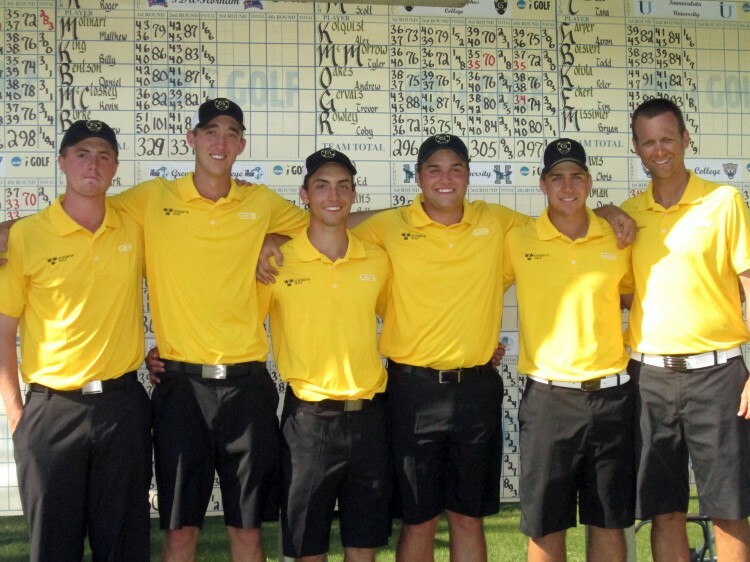 The 2012-13 Gustavus men's golf NCAA Tournament squad. 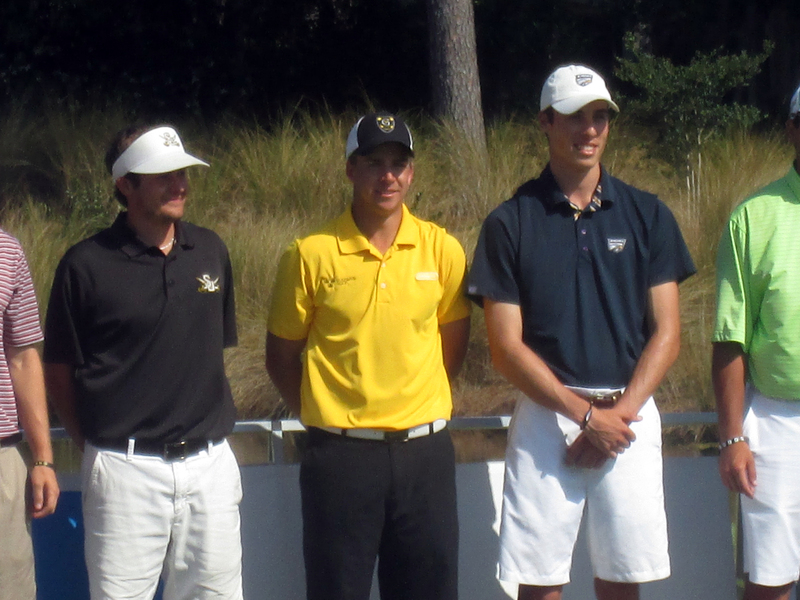 Destin, Fla. – The Gustavus men’s golf team concluded its 2013 season with a seventh place finish at the NCAA Championship on Friday afternoon. After sitting in a tie for eighth place after Thursday’s third round, the Gusties shot a nine-over-par 297 in Friday’s final round to finish seventh. It is the first time since 2004 that the Gusties have finished in the top 10. For the third straight round, Tyler McMorrow (Jr., St. Cloud, Minn.) led the way for the Gusties in the final round. McMorrow turned in an even-par 72 on Friday and finished the tournament with a two-over-par 290. The junior finished tied for fifth in the individual standings. McMorrow posted the best finish by a Gustie golfer since 2004 when Luke Benoit finished second at Southern California Golf Club. 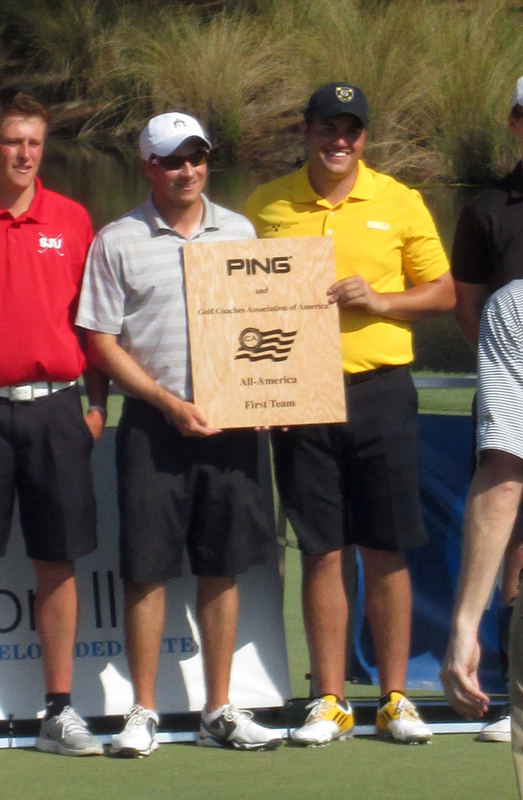 By virtue of his finish, McMorrow will earn a place on the PING All-America Team. Tyler McMorrow tied for fifth at the NCAA Championships. Following McMorrow, Trevor Gervais (Sr., Fergus Falls, Minn.) produced a two-over-par 74 on the final day of competition. After three rounds in the 80’s earlier in the week, the senior concludes his career with an impressive round and a 79th place finish. Alex Kolquist (Sr., Hermantown, Minn.) came next with a three-over-par 75 on Friday. For the tournament, Kolquist shot an 18-over-par 306 to place 46th. This year’s 46th place standing comes one year removed from a 36th place finish in last year’s NCAA Championship and two years removed from a 21st place finish in 2011 when Kolquist competed individually in the NCAA Championship. Following the tournament’s final day, Alex Kolquist was named a PING First Team All-American by GCAA. First-Team All-Americans included Cory Howard of LaGrange, Christopher Newport’s Brian Jaeger, Alex Kolquist of Gustavus Adolphus, Oglethorpe’s Anthony Maccaglia, Noah Ratner of Guilford, Brad Shigezawa of CMS, Saint John’s Casey Vangsness and Methodist’s Mike Wesko. Alex Kolquist earned a spot on the PING All-America First Team. One stroke behind Kolquist on the day, Andrew Oakes (Jr., Hermantown, Minn.) produced a round of four-over-par 76. Consistent throughout the tournament, Oakes turned in a tournament of 75-76-76-76 for a 15-over-par 303, good enough to tie for 39th place. Rounding out the Gustavus lineup on the final day was Coby Rowley (Sr., Prior Lake, Minn.) with an eight-over-par 80. The highlight of Rowley’s week was in the opening round when the senior shot an even-par 72. Rowley finished with a 23-over-par 311 to place tied for 59th. The seventh place finish marks the 10th appearance in the top 10 at the NCAA Championships in Gustavus men’s golf history, something that Head Coach Scott Moe is proud of. Congratulations fellas. Considering you barely played any golf all spring, you guys did great. Way to go Ty, All American…… Be very proud of your season, probably going to be the weirdest spring of your entire life. And that’s coming from a softball coach. Go Gusties ! !